EasyHA monitors your systems/DBs/servers to ensure systems, applications, services, and business processes are functioning properly. In the event of a failure, EasyHA can alert technical staff of the problem, allowing them to begin remediation processes before outages affect business processes, end-users, or customers. With EasyHA you will never be left having to explain why an unseen infrastructure outage hurt your organization’s bottom line. EasyHA includes cloud and mobile app, so you can check the status of your sytems/applications anytime anywhere. In this section you can learn the meaning of some terms commonly used in EasyHA. When received data are above/below the threshold, triggers go from 'Ok' into a 'Problem' state. When received data are below/above the threshold, triggers stay in/return to an 'Ok' state. EasyHA consists of several major software components, the responsibilities of which are outlined below. This is the centre of the EasyHA software. The Server can remotely check networked services (for example web servers) using simple service checks, and perform other agent-less monitoring such as CPU utilization on Linux, but it is also the central component to which the clients (browser or Win32-EasyHA-Client) will check instant information and statistics. The Server is the central repository in which all configuration, statistical and operational data are stored, and it is the entity in the EasyHA software that will actively alert administrators when problems arise in any of the monitored systems. In order to allow easy access to the monitoring data and the configuration of EasyHA from anywhere and from any platform, the Web-based Interface is provided. The web interface cannot provide instant message function. You may want to receive the notification as soon as possible. And addition to configure EasyHA to send text SMS, you can also install the Win32 EasyHA Client. When trigger fired, the icon in tray will be blinking. Your EasyHA server is running in LAN of your company. Generally speaking, it is difficult to access the EasyHA server behind firewall from internet. So we provide EasyHA Cloud service, you can synchronize the monitoring data to EasyHA Cloud, and then you can access the data anywhere. To access EasyHA Cloud, you can use browser such IE, and the better choice is EasyHA App. 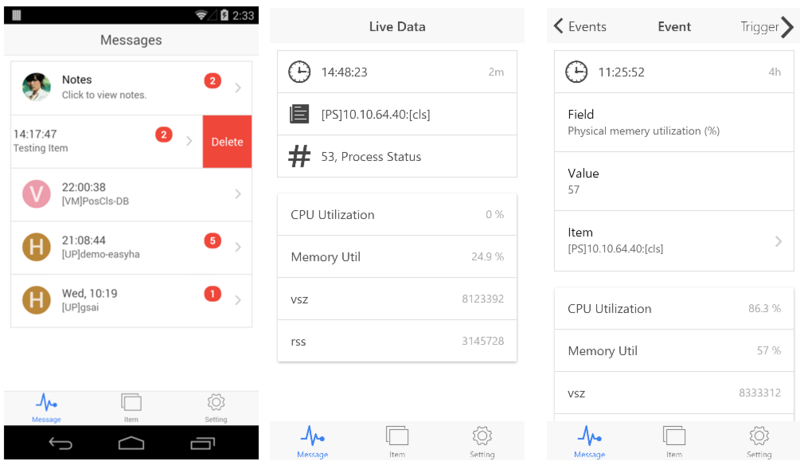 With EasyHA App, you can check the status of your servers/applications anywhere through your smart phone. What is more, you will receive notification when your predefined trigger is fired. Download the installation pack, and then unzip the downloaded file. Run the installation pack (the file name is setupEasyHA.exe) as administrator. Click START menu, click “EasyHA Server” folder, and then click “Manage EasyHA Server” button. The Java wrapper for EasyHA Server will appear. Click “Server” menu, and then click “Start” button. The server will be started; you can point your browser to http://localhost:8004/ to visit the web frontend. At the first time, you can click “Default logon” button, and then logon as “root”. After logon as root, you are better off changing the root’s password. The initial password is 1234. Download the installation pack. We provide 2 distributions for x86 and x86_64 platform. Run ./easyha, study the usage. Run nohup ./easyha -s &, start the server. Please contact the vendor support@lv2000.com. Where to download installation pack? The free trial version is available on this page: http://www.lv2000.com/easyha/download.php. 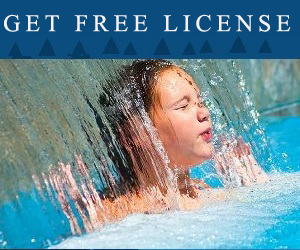 If you have purchased license, the vendor will send you the licensed copy. Which version should I choose between x86 Linux and x86_64 Linux? getconf ULONG_MAX | grep "18446744073709551615" > /dev/null && echo "x64" || echo "x86"
The EasyHA Client for Windows is free software. Please download it from http://www.lv2000.com/products/setupEasyHAClient.zip. Unzip the downloaded file, double click the setupEasyHAClient.exe. The installation wizard will guide you through installation process. Run easyhaclient.exe after the installation is finished. 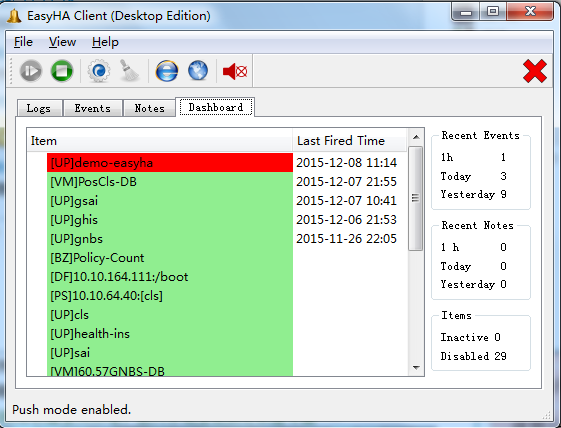 You need to fill in the host name and port of EasyHA Server the first time you run EasyHA Client. You will also need to fill in user name and password. We have released EasyHA App for iPhone, iPad and Android phone. We can connect to EasyHA Cloud by your mobile device. EasyHA app is free software. For iPhone users, please open app store, search “easyha”, you will see EasyHA client, and the click “Get” button. For Android users, please open Google Play, search “easyha”, and then install the EasyHA client. The first time you open EasyHA app, you will see the sigin-in screen. You need to fill in the EasyHA ID, and click “Sign in” button. Please visit EasyHA web frontend, logon as root. 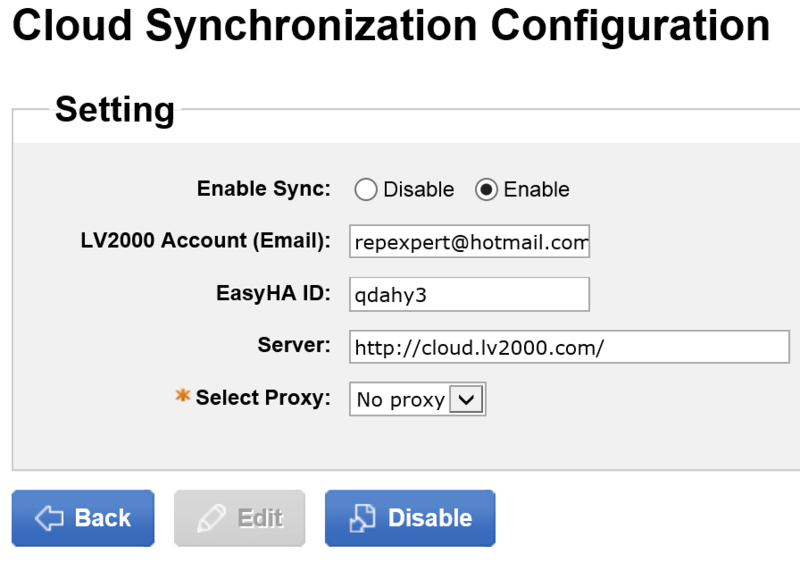 The “Cloud Synchronization Configuration” screen appear, please click “Setup Cloud Synchronization” button. Select Enable from “Enable Sync”, fill in your email address, click Save button. If your EasyHA Server cannot access internet directly, you may need to setup a proxy. The EasyHA Server will access EasyHA Cloud, apply for EasyHA ID. So you will see the EasyHA ID in next screen. I have not installed the EasyHA server, I just want to test EasyHA app, can you give an EasyHA ID for testing purpose?